The history of housing for African Americans in New York City has been one of continual mobility. Black communities have always faced the highest rents, and were displaced repeatedly from neighborhoods (and traditional forms of employment) by newly arriving immigrant groups. Before the Civil War, the majority of the black population in the city lived in the notorious Five Points neighborhood in lower Manhattan. After the violence of the 1863 draft riots, wealthier African Americans escaped Manhattan for the relative calm of the outer boroughs, and the working class black community migrated north, to Greenwich Village. In fact, the neighborhood had boasted a significant black population since the 17th century, when freed African Americans established an agricultural community in the vicinity of the Minetta stream. This population was augmented not only by New York-born blacks moving into the neighborhood, but also by the considerable northern migration of southern-born blacks in the post Civil War period. By mid-century, Greenwich Village was known as “Little Africa” and was an impoverished, densely populated area with poor sanitary conditions. The African American population in the area was concentrated in Minetta Lane and Minetta Street, where it was easiest for blacks to rent an apartment. Life in New York City was difficult for African Americans during this period. Limited employment opportunities resulted in poverty and high-density living conditions. Disease was widespread in these areas, and for many years the death rate exceeded the birth rate for blacks in the city. Little Africa was also the object of considerable white fascination: with its violence and “Black and Tan” clubs allowing for interracial socializing, whites considered the area to be one of libertine pleasures. In addition to the interracial social spaces provided by the Black and Tan clubs, the residential areas of the neighborhood were also integrated. Federal census records from 1900 show that most buildings housed both black and white families, and there were also a number of interracial couples noted in the census. In addition to significant African American and West Indian communities, there were also Irish and Italians resident in the neighborhood. 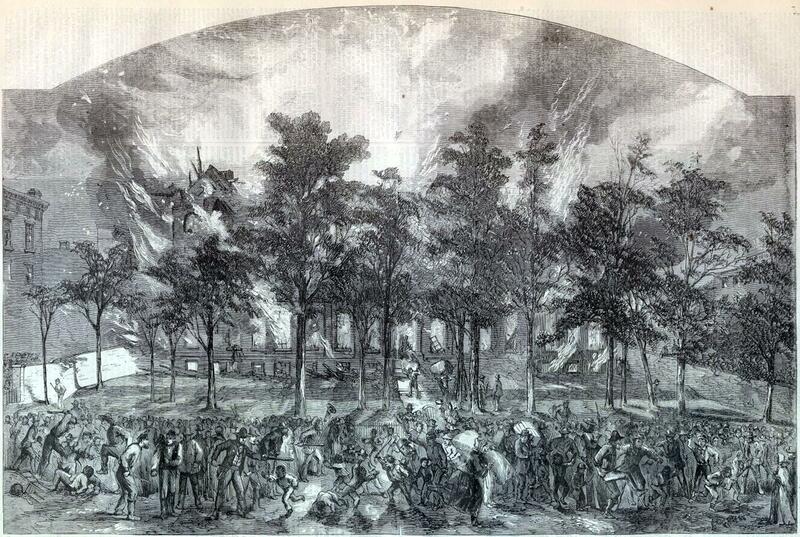 The growth of the African American population of Greenwich Village was also related to the fashionable housing which began to border Washington Square Park during the 19th century. Many blacks found employment as domestic servants in these houses. However, as immigration from Europe increased, the wealthy began to employ these new immigrant classes, eliminating a traditional form of employment for black New Yorkers. Tensions in the community heightened with growing black unemployment, and the African American community began to relocate further north to the Tenderloin district (24th through 42nd Streets) towards the end of the 19th century. However, the rapid pace of immigration of blacks from the American South meant that the black population of Greenwich Village continued to increase until the turn of the century. 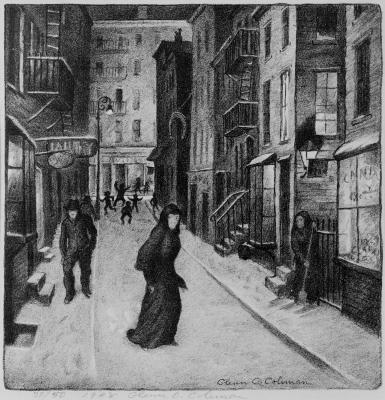 Although the residents of Minetta Lane faced significant discrimination and poverty, white liberal reformers ignored the black community of Greenwich Village. In 1913, when settlement house worker Mary Simlovich campaigned for city playgrounds for local working class children, she specifically recommended that the tenement houses on Minetta Street and Minetta Lane be torn down to make room for the playground. Clearly, she did not consider the working class black children who resided in Greenwich Village to be deserving of a neighborhood playground. Churches were the main form of local institution that catered to the black community in Greenwich Village. Local black churches included Abyssinian Baptist Church, the Zion African Methodist Church, the Bethel African Methodist Episcopal Church and the Roman Catholic Parish of St. Benedict the Moor. These churches had significant congregations of approximately one thousand members. The Zion African Methodist Church, founded in 1796 when a group of black worshippers broke with their congregation over the issue of segregation in church services, sold their original building in lower Manhattan for $90,000 and went on to own property throughout the city. Neighborhood churches provided not only religious services, but also daily community activities and entertainment such as recitals, concerts and reading groups. However, these churches all relocated around the turn of the century, following their departing congregations. From the freed slaves of the 17th century to immigrants from the American South at the turn of century, Greenwich Village has a significant history as a place of residence for New York City’s African American population. Although currently largely invisible, this history has played an important role in shaping the neighborhood that we know today. Johnson, James Wheldon. Black Manhattan. Cambridge: Da Capo Press, 1991. McFarland, Gerald W. Inside Greenwich Village: A New York City Neighborhood, 1898-1918. Amherst: University of Massachusetts, 2005. Sacks, Marcy S. Before Harlem: The Black Experience in New York City Before World War I. Philadelphia: University of Pennsylvania Press, 2006. “What happened of this stream?” This query lead me to dig up research conducted by the Mannahatta Project, a collaborative effort of scholars, researchers, scientists to reconstruct and understand the natural ecology that vastly populated the space and was particular to Manhattan Island. Researchers of the Mannahatta Project were able to discover hundreds of ponds, streams, wetlands, valleys that were leveled out for the Commissioner’s plan in 1811 to redevelop the city streets to the grid system. Due to the increasing industrialization in the city, many of these water sources were re-zoned for development. The Collect Pond, which provided one of the freshest water resources in Manhattan for 200 years, was polluted with chemicals from nearby tanneries and the overpopulation from the neighboring Five Points area. The quick transition from this violent history to the peaceful stabilization of Minetta still remains a wonder to me. I question whether part of turn around had anything to do with the city bombing of the Sixth Avenue end, close to the Minetta’s. I wonder if this was the City government’s effort to demolish the areas deemed “degenerative” as part of a city-wide effort to establish and beautify more public spaces. I do believe though, that much of the tranquil charm of both Minetta Lane and Street can be attributed to Vincent Pepe, who in the 1910’s decided to contribute to the city redevelopment plan as a Greenwich Village developer. A young Italian immigrant who followed his father into the real estate industry of New York City, Pepe was able to leverage his connections to purchase several building, lots on the Minettas, including houses and tenement buildings. Pepe was able to combine 13 buildings to the west of Minetta Street and transformed the backyards into a common garden with a back entrance. To the east of Minetta Street, Pepe and his business partners were able to aquire 1,3 and 5 Minetta Lane and 17 Minetta Street. With a large stake in property ownership, Pepe was able to execute his vision in continuing to build spaces to support and enrich the growing community. Pepe stated in a promotional brochere “The artist, the writer, the creator of beauty in any medium – these are the men for whom the Minettas should be preserved.” The street zoning, with its unique angling and narrowness, was meant to provide a sense of enclosure from the rest of the city. In an article written in 1923 for the New York Times, the Minetta’s were said to be “As free from noise and as peaceful as though miles away.” Although indeed, Pepe’s vision materialized into reality, the area was home to a diverse population of residents beyond the artists and bohemian crowd. Callahan, Jennifer. “City Lore; Minetta Moments.” New York Times, January 30 2005. Gray, Christopher. “Streetscapes / Minetta Lane and Minetta Street; Vestiges of a Develop’s Greenwich Village Enclave.” New York Times, August 29, 1999. Sanderson, Eric W., and Marianne Brown. “Mannahatta: An Ecological First Look at the Manhattan Landscape Prior to Henry Hudson.” Northeastern Naturalist 14 (4):545-570.